15mm.co.uk now has USE ME 10 support pack up and available. USE ME means 'Ultra Simple Engine for Miniature Engagements' and the system delivers just that. This title is an expansion to the basic rules and does require a rule book to make full use of it. 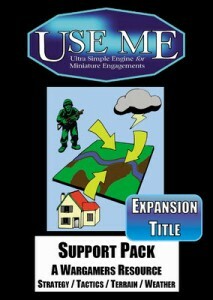 The USE ME Support Pack gives you a lot to add to your games! Suitable for use with almost any system this title is best suited to use with UM001,UM002,UM003,UM004, UM005,UM008, UM011. This expansion title began as a way to randomly generate terrain and such for the USE ME system of game titles in 15mm scale. Titles such as UM001 USE ME 15mm Science Fiction and UM003 USE ME World War Two among others. It was also used in the testing for UM012 USE ME Alien Safari with a lot of success. After some interest by the Notables Yahoo Group in a game weather generator when the idea was mentioned in posts the word count expanded a bit. Then a couple of Notables mentioned how they were using the easily grasped USE ME system to introduce their offspring to Miniature War Gaming. This sort of tied the whole idea together for a war-game supplement. So here we are!